There is a trend toward increasing transparency in science and medical labs. Designers build with fire rated glass to increase space flexibility, build collaboration, and encourage team based research. 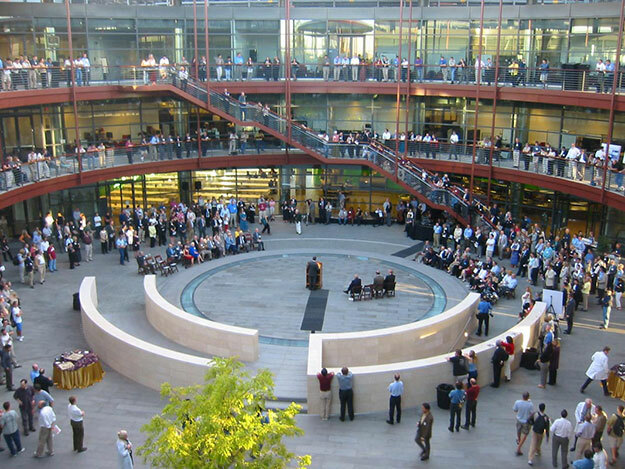 Stanford’s Clark Center built in the early 2000s to house the Bio-X program helped start a growing, national trend toward open, flexible, social, and collaborative science and medical laboratories. According to Stanford, the building has been turned inside out, with corridors replaced by external balconies, enabling completely flexible lab layouts. By bringing science labs out from the basement, and by creating open labs and informal gathering places, the Clark Center was designed to foster an unprecedented degree of collaboration to meet pressing scientific and medical challenges. Not only are scientists learning by seeing and talking to others, but they are working together in multi-disciplinary teams to solve important challenges. Iowa State University new Biorenewables Research Laboratory has four floors, 70,000 sf and 50 new research and teaching labs to bring together engineers, biologists, designers and other experts to change the way fuels are produced, revolutionize agriculture, address climate change, and the production of industrial chemicals, wrote Travis Ballstadt in September 2010. The University of Texas at San Antonio has multiple multi-disciplinary teams that share lab space, like one group that includes a plastic chemist, a biologist and an engineer who are working to develop a protein coated, plastic stint infused with stem cells. A multidisciplinary team at Stanford Bio X draws on cell biology, computer science, biochemistry, genetics and mechanical engineering to better understand how molecular chaperones perform molecular origami, which may lead to new therapies for diabetes, heart disease and cancer. 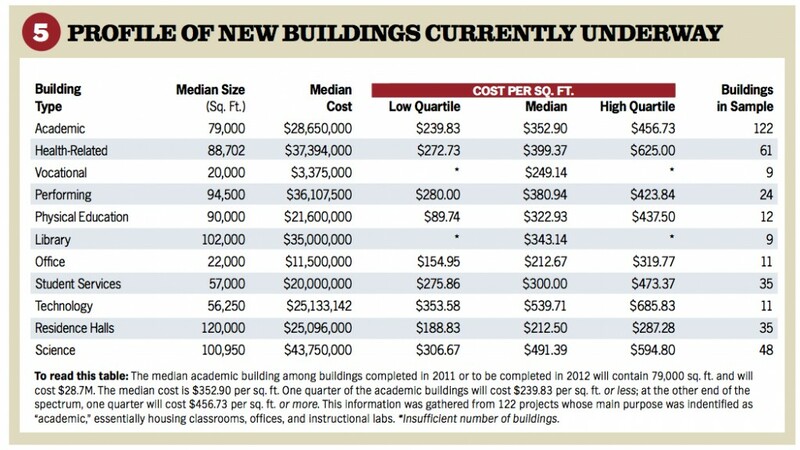 According to the 2012 Annual College Construction Report: Science buildings always cost more than academic buildings. And, the same report notes that the square foot cost of building science buildings did not vary significantly among two-year, four-year and university science buildings. Of the 122 new academic buildings completed in 2011 or underway in 2012, 109 of them (or nearly 90%) were either health-related or science buildings. Open floor plans eliminate corridors and use space more efficiently. Flexible movable furnishings can be easily adapted to fit changing teams and needs. Most of the needed services, electrical and data cabling, vacuum and compressed air piping drop down from the ceiling, so benches can be reconfigured without ripping up the floor. 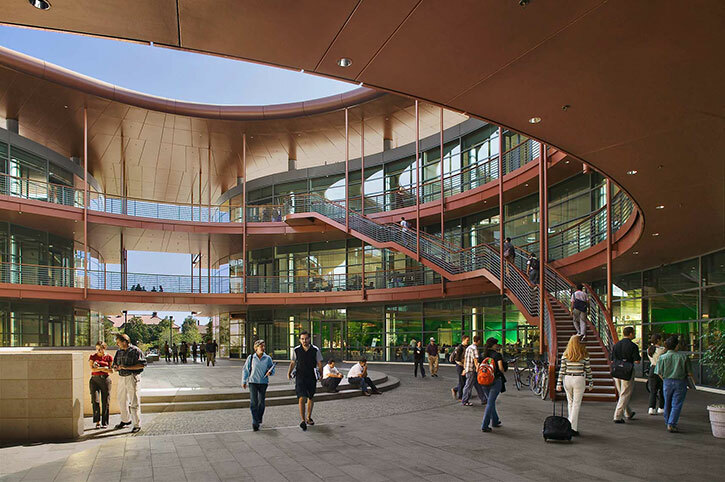 Modern science buildings make use of formerly unused spaces such as atriums and stairway as places to congregate. A typical lab uses five times more energy and water per square foot than a typical office. By bringing in natural light, designing proper ventilation systems and using energy efficient equipment, energy costs go down.